Cold War studies often focus on events in Europe. However, the Cold War quietly and sometimes loudly raged in the Middle East. Numerous political, religious and ethnic factions struggled for power while the U.S. and the Soviet Union maneuvered to exert influence and control in the region—whether behind the scenes or overtly. This week on History with Mark Bielski, Kate Tietzen returns to discuss the turmoil in the Middle East during the difficult years following WWII to the final days of the USSR. Mark first interviewed her for his podcast, “Iraq: Ancient Country, Modern Conflicts,” when they discussed the conflicts, sometime resolutions and the evolution of the country. Her in-country research delves into the many facets of the Iraqi people, the religious factions and the nation’s friends, foes and allies. 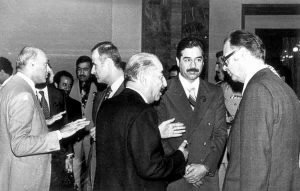 Saddam Hussein and Hafez al-Assad of Syria at an Arab Summit in Baghdad in November 1978. 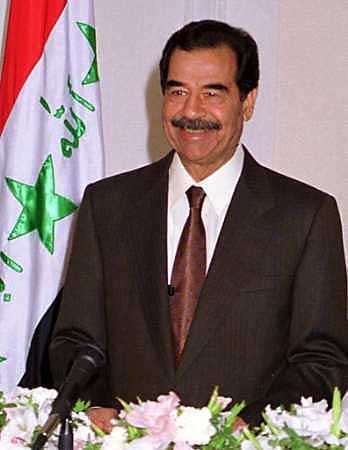 His son, the current ruler is behind to Saddam’s right.